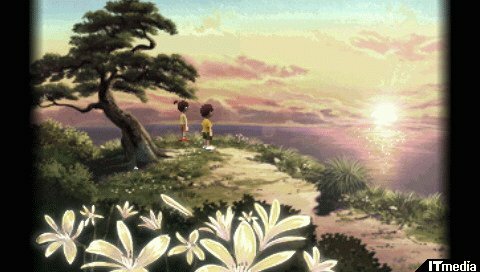 Relive Boku’s best adventure in this portable director’s cut of the PS1 classic. 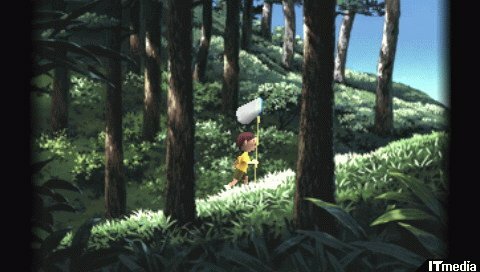 Six years ago the original Boku no Natsuyasumi was released in Japan, caught between the launch of the PlayStation 2 and the forthcoming Final Fantasy IX. It was a modest success, probably more out of timing than anything — a summer game in the summer? Wow! — but was mostly forgotten after the greater push (and success) of Boku no Natsuyasumi 2. With the arrival of the PSP, more companies are revisiting some of their best games from the past to deliver console-caliber experiences on a handheld. PS1 and Sega Saturn games have seen many ports to PSP in the past year, with many more to come, even in the face of upcoming downloadable, emulated PS1 games. 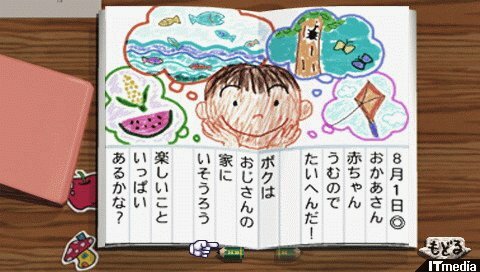 But seeing as some of the first PSP games were PS1 ports themselves, Sony’s still at it, and they’ve decided to bring the lovable summer adventure back with a fresh coat of paint in Boku no Natsuyasumi Portable. Bokunatsu Portable is a port, a remake, whatever you want to call it; it’s largely the same game. 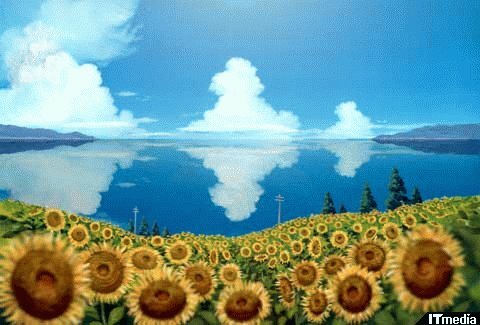 Young city boy Boku is taken to his aunt and uncle’s house in the country for his month-long summer vacation in 1975, meeting his cousins Shirabe and Moe and taking part in every summer pastime a Japanese nine year-old can. He finds a trio of similarly-aged boys to relate to and collect beetles with, and develops a crush on a college student camping by the creek in hopes of bagging herself some evidence of a wolf spirit. There’s a ton of bug collecting, fishing, kite flying and general exploration to be had in between, from sunup to sundown. Stumble upon all the right daily events at the right time and earn Boku the best adulthood, or risk the summer being all for naught. And if you can prove your mastery of beetle sumo, you’ll eventually gain access to Mt. Teppen to see the game’s most spectacular sights. To help pad out the story progression, Bokunatsu Portable adds three new characters for Boku to talk to and learn about. First there’s Yoshiko-chan, a friend of Moe’s and a little more caught up in her girliness than Boku’s cousin, whether it’s fretting about a boy, or taking a dominant tone of voice whenever little Boku’s around. Still, her heart’s in the right place. On the other end is Aniki-kun, a preteen boy with a face hidden under a baseball cap, usually found just sitting around observing. (Fun Fact: the voice of Aniki-kun, Kazuhiro Shindou, is not only a skilled juggler but was also the voice of the original Boku, therefore now performing with his younger self.) Rounding them out is Kyotou-sensei, the assistant headmaster of Moe’s high school and a character who was only alluded to in the original game. He’s out doing a lot of "field work" and answers questions Boku has about the insects and other wildlife around him. The technical side of things also has some good improvements, but hardly any of it’s perfect. The graphics have literally been brought up to speed with Bokunatsu 2, now moving along at 60 fps and with more defined modeling and bitmap backgrounds. However, to compensate for those backgrounds being originally made for a PS1 game, the screen is cropped with black borders filling the sides. It’s a larger fit than a true 4:3 image (thank goodness), but is still rather disappointing. The game’s text windows have been turned to black to go with this, which takes away from the "storybook" quality of the original white. In gameplay, a "NEW" mark appears next to nearby bugs that Boku hasn’t caught yet and a "HIT" display replaces the original vibration-based alerts when fishing. Add this all up and it looks like a good-enough sheet of upgrades, but probably the best improvement is the ability to make as many saved games as possible, graciously lifting the 15-slot limit that was a hindrance in the original and plain stupid in the sequel. 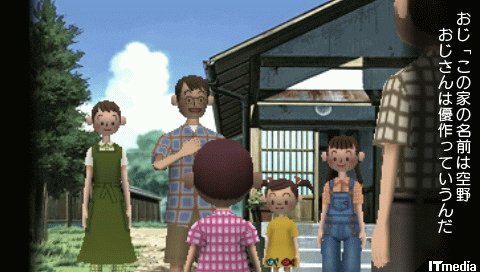 Behind the “Omake” selection at Bokunatsu’s title screen is a teaser for Boku no Natsuyasumi 3, the PS3 sequel set for next summer. A slightly older-looking Boku gets to party on a farm with a new family consisting of a teen daughter and baby sibling. The game still employs prerendered backgrounds, but with ridiculously lifelike characters to be expected of a next gen game. We are so there.